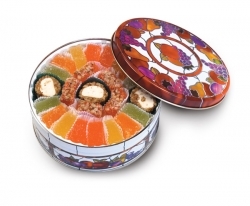 Gift giving is easy with our big Golden Tin, filled to the brim with a mix of crunchy and creamy treats. Add sweetness to their holiday with delectable chocolate-covered Bing Cherries and Blueberries, and mouthwatering White Chocolate Pretzels. They’ll also get jumbo Whole Cashews, roasted Pistachios and premium Mixed Nuts. Something for everyone in this impressive gift! 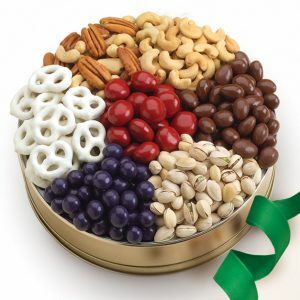 A sweet gift tin filled to the brim with Honeybell juice candies, Honeybell Milk Chocolate Crunch, Honeybell White Chocolate Dreams, and hand-dipped white Chocolate Honeybell Pretzels. 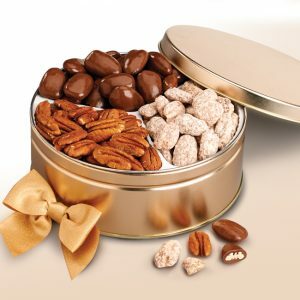 Three of the South’s pecan favorites in an attractive gift tin. First, enjoy fresh, roasted and salted natural pecan halves. Then, try our sensational pecans coated with creamy Amaretto chocolate. Last, but not least, are our sweet ‘n crunchy homemade praline pecans. The cream of the pecan crop perfectly presented for holiday giving. 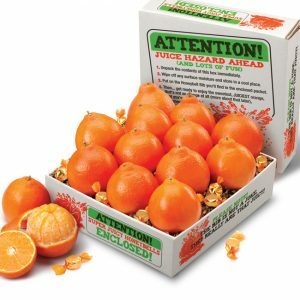 A keepsake tin is filled with a generous assortment of temptingly sweet citrus juice candies – in orange, lemon, key lime and tangerine flavors. Your gift is accented with pecan log slices and pecan orangettes. What a dramatic gift! Add an array of Florida sunset colors to your holiday celebration. Our rainbow arrangement includes Red Grapefruit, Red Scarlet Navels and Golden Navels with an accent basket of two Florida Sunset Jellies and a mix of Strawberry and Orange citrus candies. Savor the moment with this sensational gift. An impressive combination of 3 oz. 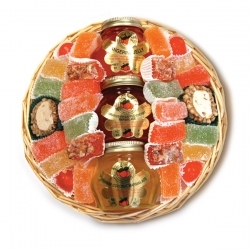 Honeybell, Orange-Pineapple-Cherry, and Orange marmalades with Florida-made juice candies, pecan log roll slices, pecan orangettes and candied cherries round out the selection. A great gift for someone special!